(Nanowerk News) Graphene, an atomically thin sheet of carbon, has been intensively studied for the last decade to reveal exceptional mechanical, electrical, and optical properties. Recently, researchers have started to explore an even more surprising property—magnetism. Theories and experiments have suggested that either defects in graphene or chemical groups bound to graphene can cause it to exhibit magnetism; however, to date there was no way to create large-area magnetic graphene which could be easily patterned. Now, scientists from the U.S. Naval Research Laboratory (NRL) have found a simple and robust means to magnetize graphene using hydrogen. 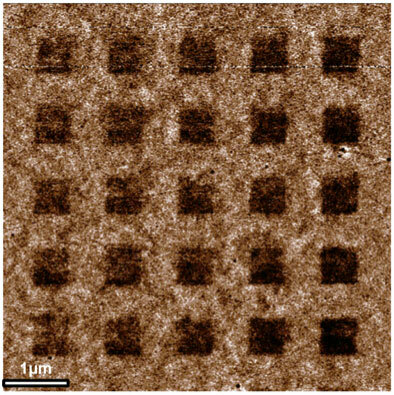 This research has been published in Advanced Materials ("Patterning Magnetic Regions in Hydrogenated Graphene Via E-Beam Irradiation"). The NRL scientists placed the graphene on a silicon wafer and then dipped it for about a minute into cryogenic ammonia with a bit of lithium. The group had recently shown that this is a quick and gentle method to add hydrogen atoms. They now see that the added hydrogen make the surface ferromagnetic. Because this method is so effective at adding hydrogen, one has to be careful about the length of exposure. Dr. Keith Whitener, NRL's Chemistry Division, explained: "This method of hydrogenation gives us access to a much wider range of hydrogen coverage than previous methods allowed, and too much hydrogen actually destroys the magnetism." However, once made, the magnetic graphene was of exceptional quality. Dr. Paul Sheehan, NRL's Chemistry Division, noted that "I was surprised that the partially hydrogenated graphene prepared by our method was so uniform in its magnetism and apparently didn't have any magnetic grain boundaries." Interestingly, the NRL group showed that the magnetic strength could be tuned by removing hydrogen atoms with an electron beam. The impact of the electrons can break the chemical bond between the graphene and the hydrogen, removing the hydrogen from the surface. Without the hydrogen, the graphene is no longer magnetic. As a result, by carefully controlling the path of the electron beam one can write magnetic patterns into the graphene (Figure). "Since massive patterning with commercial electron beam lithography system is possible, we believe that our technique can be readily applicable for current microelectronics fabrication," says Dr. Woo-Kyung Lee, materials research scientist in the Chemistry Division at NRL and project lead. Large arrays of magnetic features were quickly made, which would be particularly useful in applications from information technology to spintronics. The questions now facing the researchers are how fine the patterning of hydrogen can be and for how long the ferromagnetism can be stable. If those questions are answered, this technique could lead to a storage medium with a single hydrogenated-carbon pair storing a single magnetic bit of data, a roughly greater than million-fold improvement over current hard drives.